Shipped 1-3 day Priority Mail. 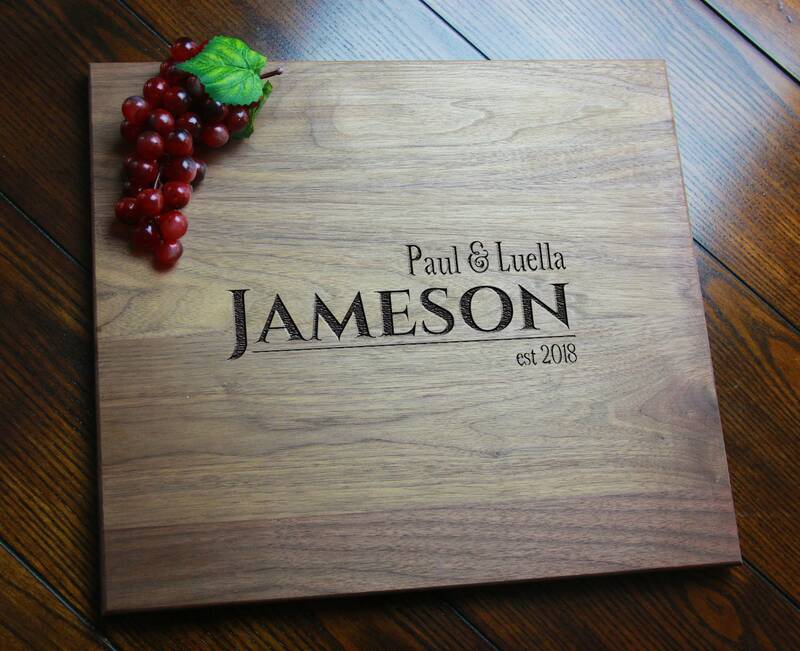 Each of my hardwood cutting boards is unique and makes an impressive addition to your home or a stunning gift for someone special. All of my boards are ready to use, made to be used and/or displayed. Ready to ship within 1-3 days depending on the difficulty of your custom request. Each board is professionally finished and hand-rubbed with my own blended board and spoon butter and conditioner. All materials and ingredients that make and finish your cutting board are SAFE for direct or indirect contact with food and exceeds FDA standards. Hardwood provides superior durability and a stable work surface which help to protect your finely honed cutting knives. Equally important is how your cutting board is constructed, how the boards and selected and matched based on color, appearance to achieve a consistent and solid board that will stand the test of time. Walnut: Classic, rich and warm chocolate hue. Cherry: Becomes a deeper red with time. Sapele: commonly used by famous guitar makers because of its characteristic figured quarter-sawn ribbon that loves to play in the light as its appearance changes as you walk and view it from various angles. Maple: Solid, simple, clean and contemporary. Do you have a slight variation of the attached example you’d like to see? Maybe add a slogan or Bible verse to the existing design? Your company logo or favorite emblem or seal? After you place your order you can easily attach your art to a convo and send it to me (vector art is preferred). After you place your order I can make a proof available on request so you can see before I engrave. Custom branding/typesetting is also available. Due to the nature of wood, color, grain and overall appearance is random and will not be exactly identical to the attached photo.